I have been Tweeting a lot recently about my WIP using hashtags such as #toohotforYA and #sexsexsex and #yummy. Today I'm giving you a peak at my YA WIP. 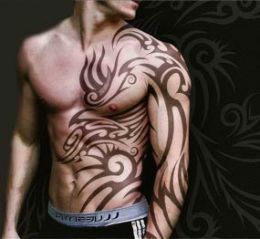 Ooo he is steamy...love that tattoo! Come to mama! HAHAHA okay, you know I couldn't resist that one.... I can't wait to read this story! Yummy hot. Working on editing a novella that was hijacked by a hot male lead as well making it a bit too x-rated:) I have to change it now to make it PG as the novella follows a PG rated Novel. Maybe I'll just have two versions? Now you've diverted my attention for the rest of the day! I'm just glad that none of my students look like that. Yowza. And my first thought was 'well hello there'. He definitely got my attention! I hope some day we get to read him too! I love reading stuff with male protagonists probably because I am a guy. * incoming rant* but also note how much time and effort it takes to look like that. Seriously all the dudes in YA are ripped like that but half of them don't do anything. If it's a supernatural explanation, like being an angel of demon then fine but otherwise no. *end rant* Anyways looking forward to reading about a male protagonist they are too far and few between.